Run a 10k this February. 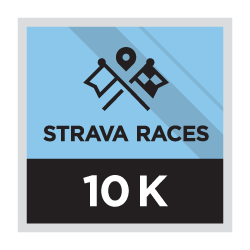 Strava is challenging you to run 10k as fast as you can between February 1st and February 28th. Unlike a typical 10k race, tackle this Challenge from any location, at any time of day. Skip the travel and the pre-dawn alarm clock. Don't skip the chance to push yourself, and the pace, to see how far you can climb the Leaderboard. Just pick a safe stretch of road (or trail), record an activity that is at least 10 kilometers long, and see where you stack up against runners across the world. Your position on the Leaderboard is based on the fastest average pace of any activities that meet the Challenge goal requirements. The average pace is taken based on elapsed time and includes the entire duration of the qualifying activity (not just the fastest 10k section of your activity). Athletes that complete this Challenge will receive a digital finishers badge (and potentially a new 10k PR). The Leaderboard is sorted based on the average pace of the qualifying activity. This means the faster you run during your activity, the higher you will show up on the Leaderboard. All activities logged during the Challenge period must be uploaded to Strava no later than March 3rd, 2014. A: You can run the 10 kilometers necessary to complete the Challenge in a single run any day between February 1st and February 28th.